End of the Road to Reality? Or the end of theoretical physics? In my previous post, I mentioned the Goliath of science and engineering: the Large Hadron Collider (LHC), built by the European Organization for Nuclear Research (CERN) under the Franco-Swiss border near Geneva. I actually started uploading some pictures, but then I realized I should write a separate post about it. So here we go. In case you wonder what’s being scattered here… Well… All kinds of things – but so the original collision is usually between protons (so these are hydrogen ions: H+ nuclei), although the LHC can produce other nucleon beams as well (collectively referred to as hadrons). These protons have energy levels of 4 TeV (tera-electronVolt: 1 TeV = 1000 GeV = 1 trillion eV = 1×1012 eV). Now, let’s think about scale once again. Remember (from that same previous post) that we calculated a wavelength of 0.33 nanometer (1 nm = 1×10–9 m, so that’s a billionth of a meter) for an electron. Well, this LHC is actually exploring the sub-femtometer (fm) frontier. One femtometer (fm) is 1×10–15 m so that’s another million times smaller. Yes: so we are talking a millionth of a billionth of a meter. The size of a proton is an estimated 1.7 femtometer indeed and, as you surely know, a proton is a point-like thing occupying a very tiny space, so it’s not like an electron ‘cloud’ swirling around: it’s much smaller. In fact, quarks – three of them make up a proton (or a neutron) – are usually thought of as being just a little bit less than half that size – so that’s about 0.7 fm. It may also help you to use the value I mentioned for high-energy electrons when I was discussing the LEP (the Large Electron-Positron Collider, which preceded the LHC) – so that was 104.5 GeV – and calculate the associated de Broglie wavelength using E = hf and λ = v/f. The velocity v is close to c and, hence, if we plug everything in, we get a value close to 1.2×10–15 m indeed, so that’s the femtometer scale indeed. [If you don’t want to calculate anything, then just note we’re going from eV to giga-eV energy levels here, and so our wavelength decreases accordingly: one billion times smaller. Also remember (from the previous posts) that we calculated a wavelength of 0.33×10–6 m and an associated energy level of 70 eV for a slow-moving electron – i.e. one going at 2200 km per second ‘only’, i.e. less than 1% of the speed of light.] Also note that, at these energy levels, it doesn’t matter whether or not we include the rest mass of the electron: 0.511 MeV is nothing as compared to the GeV realm. In short, we are talking very very tiny stuff here. But so that’s the LEP scale. I wrote that the LHC is probing things at the sub-femtometer scale. So how much sub-something is that? 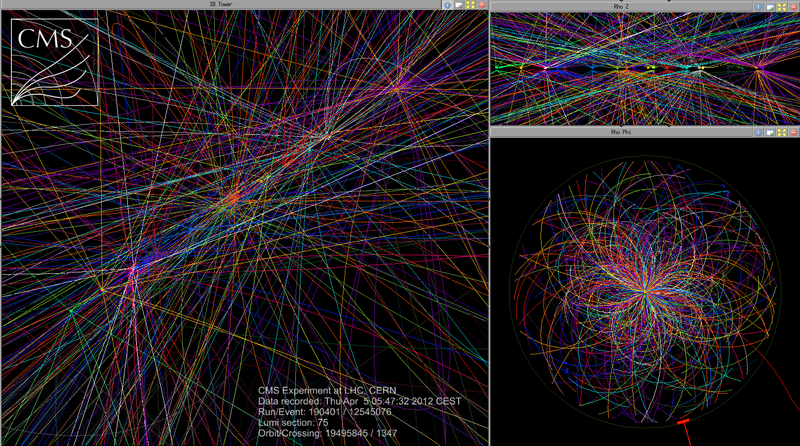 Well… Quite a lot: the LHC is looking at stuff at a scale that’s more than a thousand times smaller. Indeed, if collision experiments in the giga-electronvolt (GeV) energy range correspond to probing stuff at the femtometer scale, then tera-electronvolt (TeV) energy levels correspond to probing stuff that’s, once again, another thousand times smaller, so we’re looking at distances of less than a thousandth of a millionth of a billionth of a meter. Now, you can try to ‘imagine’ that, but you can’t really. Photons for the electromagnetic force. Finally, the existence of the Higgs particle – and, hence, of the associated Higgs field – has been predicted since 1964 already, but so it was only experimentally confirmed (i.e. we saw it, in the LHC) last year, so Peter Higgs – and a few others of course – got their well-deserved Nobel prize only 50 years later. The Higgs field gives fermions, and also the W+, W–, and Z bosons, mass (but not photons and gluons, and so that’s why the weak force has such short range – as compared to the electromagnetic and strong forces). So there we are. We know it all. Sort of. Of course, there are many questions left – so it is said. For example, the Higgs particle does actually not explain the gravitational force, so it’s not the (theoretical) graviton, and so we do not have a quantum field theory for the gravitational force. [Just Google it and you’ll see why: there’s theoretical as well as practical (experimental) reasons for that.] Secondly, while we do have a quantum field theory for all of the forces (or ‘interactions’ as physicists prefer to call them), there are a lot of constants in them (much more than just that Planck constant I introduced in my posts!) that seem to be ‘unrelated and arbitrary.’ I am obviously just quoting Wikipedia here – but it’s true. Waw ! That’s a pretty damning statement, isn’t it? In short, all of the celebrations around the experimental confirmation of the Higgs particle cannot hide the fact that it all looks a bit messy. There are other questions as well – most of which I don’t understand so I won’t mention them. To make a long story short, physicists and mathematicians alike seem to think there must be some ‘more fundamental’ theory behind. But – Hey! – you can’t have it all, can you? And, of course, all these theoretical physicists and mathematicians out there do need to justify their academic budget, don’t they? And so all that talk about a Grand Unification Theory (GUT) is probably just what is it: talk. Isn’t it? Maybe. The key question is probably easy to formulate: what’s beyond this scale of a thousandth of a proton diameter (0.001×10–15 m) – a thousandth of a millionth of a billionth of a meter that is. Well… Let’s first note that this so-called ‘beyond’ is a ‘universe’ which mankind (or let’s just say ‘we’) will never see. Never ever. Why? Because there is no way to go substantially beyond the 4 TeV energy levels that were reached last year – at great cost – in the world’s largest particle collider (the LHC). Indeed, the LHC is widely regarded not only as “the most complex and ambitious scientiﬁc project ever accomplished by humanity” (I am quoting a CERN scientist here) but – with a cost of more than 7.5 billion Euro – also as one of the most expensive ones. Indeed, taking into account inflation and all that, it was like the Manhattan project indeed (although scientists loathe that comparison). So we should not have any illusions: there will be no new super-duper LHC any time soon, and surely not during our lifetime: the current LHC is the super-duper thing! Well… I don’t know. Physicists refer to the zone beyond the above-mentioned scale (so things smaller than 0.001×10–15 m) as the Great Desert. That’s a very appropriate name I think – for more than one reason. And so it’s this ‘desert’ that Roger Penrose is actually trying to explore in his ‘Road to Reality’. As for me, well… I must admit I have great trouble following Penrose on this road. I’ve actually started to doubt that Penrose’s Road leads to Reality. Maybe it takes us away from it. Huh? Well… I mean… Perhaps the road just stops at that 0.001×10–15 m frontier? In fact, that’s a view which one of the early physicists specialized in high-energy physics, Raoul Gatto, referred to as the zeroth scenario. I am actually not quoting Gatto here, but another theoretical physicist: Gerard ‘t Hooft, another Nobel prize winner (you may know him better because he’s a rather fervent Mars One supporter, but so here I am referring to his popular 1996 book In Search of the Ultimate Building Blocks). In any case, Gatto, and most other physicists, including ‘T Hooft (despite the fact ‘T Hooft got his Nobel prize for his contribution to gauge theory – which, together with Feynman’s application of perturbation theory to QED, is actually the backbone of the Standard Model) firmly reject this zeroth scenario. ‘T Hooft himself thinks superstring theory (i.e. supersymmetric string theory – which has now been folded into M-theory or – back to the original term – just string theory – the terminology is quite confusing) holds the key to exploring this desert. But who knows? In fact, we can’t – because of the above-mentioned practical problem of experimental confirmation. So I am likely to stay on this side of the frontier for quite a while – if only because there’s still so much to see here and, of course, also because I am just at the beginning of this road. 🙂 And then I also realize I’ll need to understand gauge theory and all that to continue on this road – which is likely to take me another six months or so (if not more) and then, only then, I might try to look at those little strings, even if we’ll never see them because… Well… Their theoretical diameter is the so-called Planck length. So what? Well… That’s equal to 1.6×10−35 m. So what? Well… Nothing. It’s just that 1.6×10−35 m is 1/10 000 000 000 000 000 of that sub-femtometer scale. I don’t even want to write this in trillionths of trillionths of trillionths etcetera because I feel that’s just not making any sense. And perhaps it doesn’t. One thing is for sure: that ‘desert’ that GUT theorists want us to cross is not just ‘Great’: it’s ENORMOUS! Hmm… Feynman and ‘T Hooft… Two giants in science. Two Nobel Prize winners – and for stuff that truly revolutionized physics. The amazing thing is that those two giants – who are clearly at loggerheads on this one – actually worked closely together on a number of other topics – most notably on the so-called Feynman-‘T Hooft gauge, which – as far as I understand – is the one that is most widely used in quantum field calculations. But I’ll leave it at that here – and I’ll just make a mental note of the terminology here. The Great Desert… Probably an appropriate term. ‘T Hooft says that most physicists think that desert is full of tiny flowers. I am not so sure – but then I am not half as smart as ‘T Hooft. Much less actually. So I’ll just see where the road I am currently following leads me. With Feynman’s warning in mind, I should probably expect the road condition to deteriorate quickly. Post scriptum: You will not be surprised to hear that there’s a word for 1×10–18 m: it’s called an attometer (with two t’s, and abbreviated as am). And beyond that we have zeptometer (1 zm = 1×10–21 m) and yoctometer (1 ym = 1×10–23 m). In fact, these measures actually represent something: 20 yoctometer is the estimated radius of a 1 MeV neutrino – or, to be precise, its the radius of the cross section, which is “the effective area that governs the probability of some scattering or absorption event.” But so then there are no words anymore. The next measure is the Planck length: 1.62 × 10−35 m – but so that’s a trillion (1012) times smaller than a yoctometer. Unimaginable, isn’t it? Literally. Note: A 1 MeV neutrino? Well… Yes. 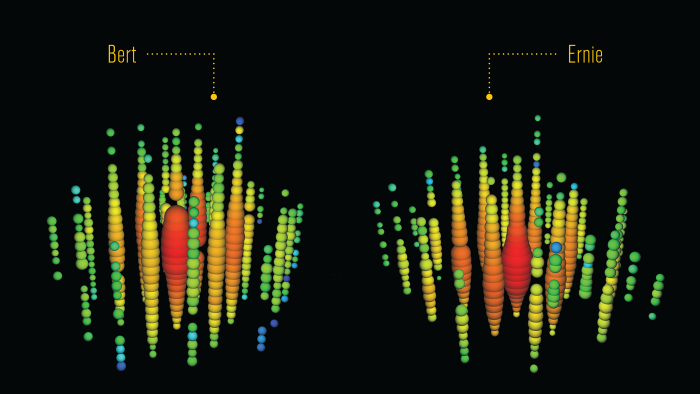 The estimated rest mass of an (electron) neutrino is tiny: at least 50,000 times smaller than the mass of the electron and, therefore, neutrinos are often assumed to be massless, for all practical purposes that is. However, just like the massless photon, they can carry high energy. High-energy gamma ray photons, for example, are also associated with MeV energy levels. Neutrinos are one of the many particles produced in high-energy particle collisions in particle accelerators, but they are present everywhere: they’re produced by stars (which, as you know, are nuclear fusion reactors). In fact, most neutrinos passing through Earth are produced by our Sun. The largest neutrino detector on Earth is called IceCube. It sits on the South Pole – or under it, as it’s suspended under the Antarctic ice, and it regularly captures high-energy neutrinos in the range of 1 to 10 TeV. Last year (in November 2013), it captured two with energy levels around 1000 TeV – so that’s the peta-electronvolt level (1 PeV = 1×1015 eV). If you think that’s amazing, it is. But also remember that 1 eV is 1.6×10−19 Joule, so it’s ‘only’ a ten-thousandth of a Joule. In other words, you would need at least ten thousand of them to briefly light up an LED. The PeV pair was dubbed Bert and Ernie and the illustration below (from IceCube’s website) conveys how the detectors sort of lit up when they passed. It was obviously a pretty clear ‘signal’ – but so the illustration also makes it clear that we don’t really ‘see’ at such small scale: we just know ‘something’ happened.